Took the new GH4 to the 119th Sequim Irrigation Festival Fireworks. I thought it would be good to use the Cinema 24p at 4K on the camera. That's right, the camera records at 24 frames per second just like a film motion picture camera. None of this 24.976 stuff to NTSC. 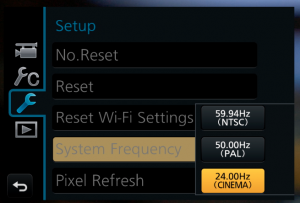 Just set the camera to 24.00Hz (CINEMA) in the Setup menu under System Frequency and the camera will only record 24p. Now we really have a motion picture camera. This is the first 4K test with the new camera that I am publishing. I recorded the footage at 100mbps IPB on to a HoodMan RawSteel 32gig Class 10 U1 SDHC card with no problems. On a 32 gig card the camera estimates that you have about 40minutes of record time. There will a an article soon explaining the differences in the 4K modes in the GH4. We are in a new exciting world with the GH4. Tagged 4K, DMC-GH4, Lumix GH4. Bookmark the permalink.